Typically, in the Artist Spotlight series, we take the time to highlight a contemporary artists who, for one reason or another, is making headlines. Sometimes, however, the pull of an artist is so great, the work and character so appealing, that it is impossible to avoid writing about them. 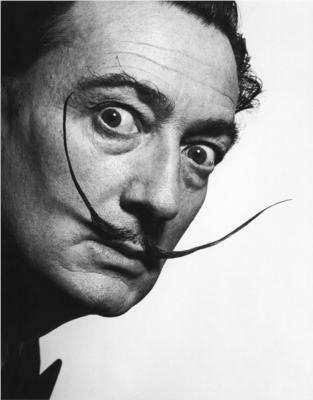 Salvador Dali is just one such man, although calling him a mere mortal seems like an insult to his memory. One of the world's most famous Surrealists, and one of the founders of the entire Surrealist movement, Dali was a figure literally like no other. Sporting a famously bizarre moustache, it sometimes seems like his entire character could be extrapolated from that one personal detail. Precise, talented, flexible, and completely out to lunch, Dali was nevertheless incredibly creative and gifted, always hoping to push the envelope of what could be accomplished at the time. Perhaps most famous for his melting clocks (the actual piece is entitled 'The Persistence of Memory,' and hangs in the Museum of Modern Art in New York City, just so you know), Dali was one of the great technical experimenters outside of the world of painting. We think of 3D movies and stereoscopic glasses as something that has just begun to gain popularity, but Dali and Walt Disney were experimenting with the technique nearly 50 years ago. Not much actually was produced by their collaboration in terms of functional technology, but nevertheless the foundations were laid for the future of stereoscopic imaging. Few areas of the world were closed to him, in fact, and he experimented with a large number of media, and pushed the boundaries of what was regarded as art at the time. Perhaps most interestingly, though, was that he was one of the first to realize that being his own character, being larger than life, could advance the rest of his career - probably most notable was him showing up to a fancy dress ball in New York with Gala, the love of his life, dressed up as the Lindbergh Baby and kidnapper. He eventually decided to apologize given the uproar, but it's the perfect example of how he pushed envelopes in everything he did. In the words of Sigmund Freud, the famous psychoanalyst, "I have been inclined to regard the Surrealists as complete fools, but that young Spaniard with his candid, fanatical eyes and his undeniable technical mastery, has changed my estimate." So too has he done for us all.